2. Click or drag the part circled in red below will alter the value or state of the corresponding element. 3. "f.s.d.V. " 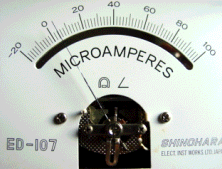 stands for "full-scale-deflection voltage", it is the maximum voltage the meter can measure without the aid of an external resistor. The f.s.d.I. is f.s.d.V./R. 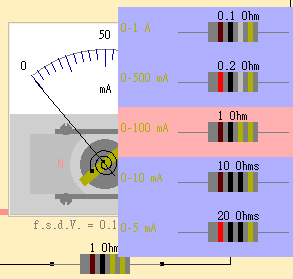 An ammeter can be converted from a galvanometer of small full-scale-deflection current by connecting a small resistor in parallel with it. This small resistor is known as a shunt. A large portion of the current being measured will then flow through the shunt.